Shaykh Sayah Atouri has returned to his home in the Naqab (Negev-area) village of Al Araqib, Tuesday, after winning his appeal to a Be’er Sheva court. “I feel like a newborn”, said the Shaykh as he entered the village late Tuesday morning. Sayah spent ten days in an Israeli jail, prior to a further ten days spent in a protest tent pitched near a police station in the Naqab town of Rahat. For the past three weeks, Sayah has been prohibited from entering his village, following a court order issued, after his detention. in regard to a home demolition. His release from jail was contingent upon him not re-entering his village until the court had reached its verdict, AIC reports. “This case establishes precedence”, stated Shaykh Sayah. His hopes are that, in the future, judges will acknowledge the right of Bedouins to remain on their land and fight for their rights. “But, the next time”, he added, ”I would rather go to prison than agree to stay away from my village”. 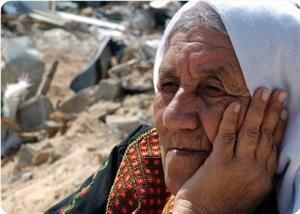 Sayah was arrested on November 20, when Israeli officials demolished homes in the Al Araqib village for the 61st time. Police accused Shaykh Sayah of breaking the release terms of the order issued against him in October, following an incident involving his alleged “trespassing” on land which had been claimed by the state of Israel. 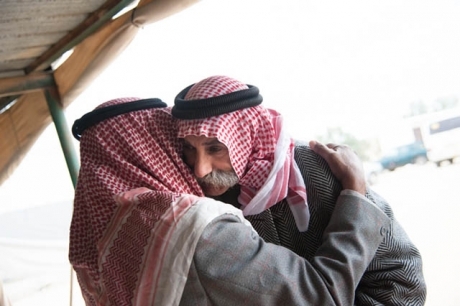 The continued demolitions of Al Araqib come to the Bedouin as part of the Jewish National Fund’s (JNF) plans to implement a forestation project, titled the “Ambassadors' Forest”, in honour of assistance provided by pro-Israeli world diplomatic corps. The Bedouin have inhabited the area since 1905, but are currently engaged in a bitter struggle over land ownership with the Israeli state, which continues to expropriate their land and displace local indigenous inhabitants. Israeli occupation forces (IOF) razed a Palestinian house in Duyuk village in the central Jordan Valley near Jericho city afternoon Wednesday. Local sources said that IOF soldiers in a number of army vehicles escorted a huge bulldozer into the village, adding that they encircled the home of Nidal Bililat and destroyed it at the pretext it was built without permit in area C.
Bililat told the PIC reporter that the Israeli occupation authorities did not notify him of the demolition beforehand as is the practice. In another incident, IOF soldiers roamed the streets of Jenin city and its refugee camp and set up roadblocks, local sources said, adding that the soldiers detained three citizens in Jenin refugee camp for field interrogation then released them. A new Israeli-planned road, ostensibly meant to give the Cremisan Monastery access to Israel and Jerusalem, will cut off the Bethlehem-area village of al-Walaja from its lands. Its lands were taken and villagers displaced in first in 1948; in recent years Israel began completely surrounding it with the separation wall, taking even more land. Village resident Hisham Abu Ali is done being silent. In September 2013, inhabitants of al-Walaja witnessed the start of the building of a new road on their lands. The road is said to ensure access to Jerusalem from the Cremisan Monastery which would find itself on the other side of the Israeli separation wall (i.e., on the “Jerusalem side”) if it is built as currently planned. There is still a pending court case, however, filed in the name of Beit Jala residents and the Salesian Sisters who have a convent and a school next to the Cremisan Monastery, in regards to wall’s route (see petition by Saint Yves organization). The result of this legal battle, which will be taken to the Israeli High Court next month, will determine the access points of the Cremisan Monastery to Jerusalem and the West Bank. My name is Hisham Abu Ali, I was born in al-Walaja in 1969. Al-Walaja is a Palestinian village located in the Bethlehem Governate, a few kilometers far from Jerusalem. I’m writing this letter because of the latest catastrophe my village is confronted with. I’m writing because I wish to stop it, and I hope it is the last one. Three months ago Israel started building a new road on my family’s land. This land has belonged to my family for generations; my grandfather was farming wheat and barley even before 1948. Now we have olive trees there. The new construction will destroy our trees and will take our land. 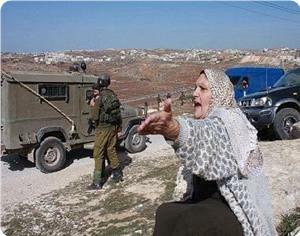 That’s the ultimate consequence of Israeli occupation in our village. Since the construction of the new road started, I go and sit in my land every day. I can’t stay far from it. I’m afraid that they will take advantage of the construction in order to destroy more than what they are authorized to. Just today I found that they marked five extra olive trees that should not be uprooted according to their own plans. Since the Palestinian catastrophe (the 1948 Nakba), Palestinians have been witnessing disasters, one after another, brought on by the Israeli occupier. Cities, villages and refugee camps pay the price of these aggressive actions. 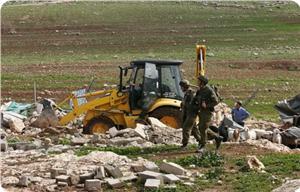 Israel occupies lands, replaces villagers’ lands with settlements and carries out various projects for Israelis. Al-Walaja is like many other villages. It is not immune from from Israeli plans. It was completely destroyed in the 1948 catastrophe. 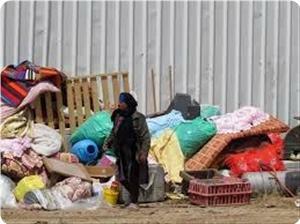 Its people were exiled and escaped to different regions, living in refugee camps in Palestine and abroad. After the 1948 war some of its agricultural land remained on the other side of the Armistice Line, so some people came back. Many families built houses there and set up a small village with the few resources they had. In 1967, however, Israel occupied the West Bank. Once again, most Palestinians from al-Walaja were forced to leave. Israel founded a settlement now known as Har Gilo, which took several parts of Al Walaja’s — and nearby Beit Jala’s — land. 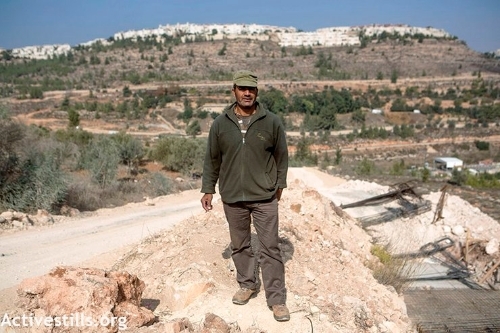 Israel built roads around it in order to prevent the villagers from reaching those areas. Moreover, Israeli authorities are now building the “separation” wall to seize the village and they ultimately want to build a national park for Israelis. 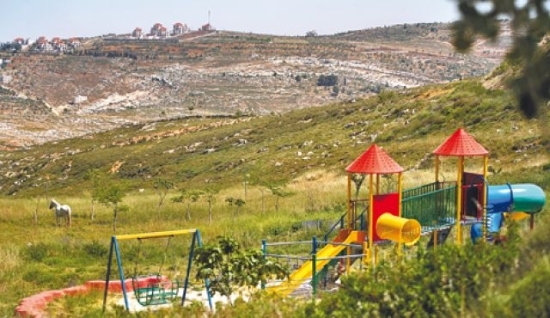 This park is intended to preserve the rural landscape and the terraced agricultural land that Palestinians still farm. However, once the wall is finished, Palestinian farmers will not be able to reach their land anymore. The new road is being constructed in the park area. It is destroying the same agricultural fields and olive trees that the park is intended to preserve. How can you say you are building a park by destroying ancient trees to replace them with a wide concrete road? Recently, they decided to uproot 50 olive trees belonging to my family. We received the yellow card which alerted us to remove our trees and we are supposed to receive the red card announcing their end. Israeli authorities claim that this road serves the Cremisan Monastery, while I believe this is not their aim. They consistently promote new plans that destroy our village and make our lives harder and harder. These Israeli actions are nothing. But what saddens me is that there have been no popular actions opposing Israel’s latest aggressive deeds. 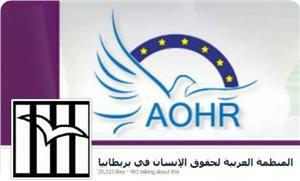 Popular and official actions should have taken place in order to stop Israel’s hostility against the village. Israeli actions against the village must be stopped, especially the road that will steal its land. This message is being sent directly to the Cremisan Monastery, which Israel claims the new road will serve. All the while, the Cremisan Monastery remains silent. It is important for us that Cremisan announces its view toward this plan and stands with us against this road and the new land grab that we are witnessing. Isn’t the church supposed to be an advocate against property theft? We don’t understand why our land will be taken for the sake of Cremisan or a park. This is our land, and it is again being stolen from us. We demand an immediate stop of construction of the road and the destruction of our trees and lands. Israeli occupation forces (IOF) unleashed their bulldozers in the northern Jordan Valley on Tuesday razing homes and displacing entire families. Local sources said that IOF soldiers demolished houses for shepherds near Yarza village to the east of Tobas city and Farsiya area in the northern Jordan Valley. They said that Palestinian families depending on farming and sheep breeding were now rendered homeless in the cold, winter weather sweeping the region. The sources said that the soldiers deliberately hit a 40-year-old woman on her head during their forced evacuation of those houses, adding that the soldiers did not allow medical teams to treat her. Israeli forces demolished a house and several steel structures and tents in the northern Jordan Valley on Tuesday morning, a local spokesman said. Fathi Khdeirat, a spokesman of the Campaign to Protect the Jordan Valley, told Ma'an that Israeli bulldozers escorted by several military wrecked a house in al-Jiftlik. In the nearby village of Fasayil, meanwhile, bulldozers tore down two steel structures used for agriculture. Two tents were pulled down in Barza neighborhood, added Khdeirat. He said that demolitions were part of an ongoing Israeli campaign "to displace Palestinian residents of the Jordan Valley." Israel has destroyed more than 558 Palestinian properties in the West Bank and East Jerusalem since the beginning of this year, displacing 919 people, according to UNOCHA. The majority of the Jordan Valley is under full Israeli military control, despite being within the Palestinian West Bank. Israeli Occupation Forces (IOF) arrested on Monday morning a Palestinian young man from al-Khalil and issued two demolition notices against two houses in Yatta town in al-Khalil southern West Bank. IOF soldiers violently stormed Tariq Jawad's house and damaged its furniture before arresting his nephew and taking him to an unknown destination, Palestinian security sources said. On the other hand, Israeli forces shot a vehicle in Aroub refugee camp, claiming that it was stolen. The vehicle crashed into a military jeep. IOF soldiers stormed Carmel area in Yatta where they erected several checkpoints and raided several houses. A number of people and vehicles were detained for several hours in cold weather. Ratib Jabour, coordinator for the Popular Committee in Yatta town, said that Israeli occupation forces served two demolition notifications in the town. On Tuesday 10 December 2013, at 7:00 PM, AICafe invite you for a screening of the film Sumoud. The Naqab (Negev) area village of al-Araqib is a symbol of the struggle against the Prawer plan, which would forcibly evict some 30,000 Bedouin citizens of Israel from their homes and land. 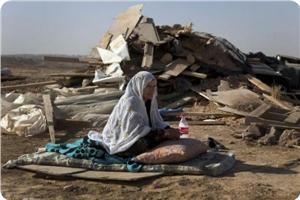 Israeli authorities demolished the Bedouin village of al-Araqib 30 times in the span of one year. Despite seemingly insurmountable odds, residents have rebuilt their homes and have vowed to remain on their ancestral lands. Sumoud: The Struggle for al-Araqib, is the story of their ongoing fight for recognition, equality and the right to live with dignity and in peace. 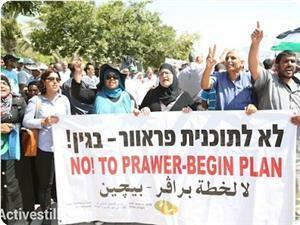 Join in protest of the Prawer plan! The AIC is a joint Palestinian-Israeli activist organization engaged in dissemination of information, political advocacy and grassroots activism. The AICafè is a political and cultural café open on Tuesday and Saturday night from 7pm until 10pm. It is located in the Alternative Information Center in Beit Sahour, close to Suq Sha'ab (follow the sign to Jadal Center ). We have a small library with novels, political books and magazines. We also have a number of films in DVD copies and AIC publications which critically analyze both the Palestinian and Israeli societies as well as the conflict itself. 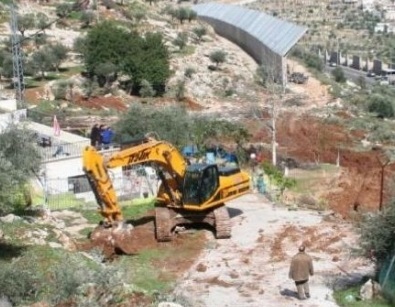 Local sources have reported that Israeli military bulldozers uprooted more than 40 Olive trees in order to connect settler road #60 with the Cremisan Monastery in Beit Jala town, west of Bethlehem, and other areas. Orchard owner, Hisham Abu Ali, stated that the army previously uprooted 15 trees in his orchard in order to expand the road, and came back today to uproot 40 more olive trees, the Palestinian News & Agency (WAFA) has reported. Road construction and expansion is leading to massive illegal confiscation of Palestinian lands in occupied East Jerusalem, including Beit Safafa town, and in Bethlehem. 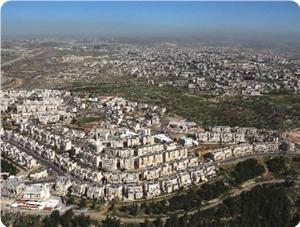 Israel also intends to build “National Gardens” in the area. Furthermore, soldiers completely isolated 12 Palestinian villages near Yatta town, south of the southern West Bank city of Hebron. Coordinator of the Popular Committee against the Wall and Settlements in Yatta town, said that the soldiers placed concrete blocks sealing the main road linking Yatta with its eastern communities. Soldiers also declared the area a closed military zone, stopped and searched dozens of residents and vehicles, and forced them back. The film brings to light the suffering and embittered lives of the Palestinian Bedouin residents of Negev, especially those villages which the government of Israel doesn’t recognize. 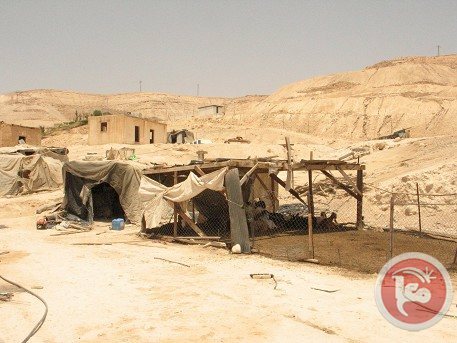 Those residents, according to the film “Negev … Land and Man,” have been deprived of basic life requirements including water and electricity networks as well as schools and clinics. The documentary warns of Israeli plans to displace the population and “steal their land” through heavy restrictions to make their lives unbearable. The film warns in particular of the Prawer displacement plan which will “bring back the Palestinian Nakba on the land of Negev” while the world watches. Documented scenes of home demolitions, land bulldozing and displacement of residents by Israeli forces are included in the film. The film also sheds light on the major role Palestinians who live in Israel play to support the Bedouin residents of the Negev and help strengthen their determination to remain on their land. 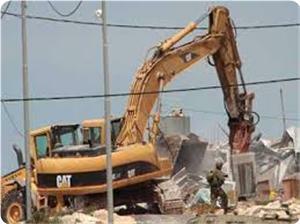 These efforts include construction projects, relief activities and voluntary work to defy Israeli plans. The film was directed by Muhammad Abu Rizqa and produced by Sanabil Productions. Israeli occupation forces (IOF) threatened on Sunday to open fire at landowners in Yatta town, south of Al-Khalil, if they ventured into their land. Local sources said that IOF soldiers told Nawaja family members from Susiya near Yatta that they would not be allowed to access their land at the pretext it was under Israeli control according to the Oslo accords. They said that the soldiers threatened to confiscate agricultural equipment from the family members. Other sources said that the soldiers blocked farmers from tending to their land to provide security for settlers in the nearby Susiya settlement. 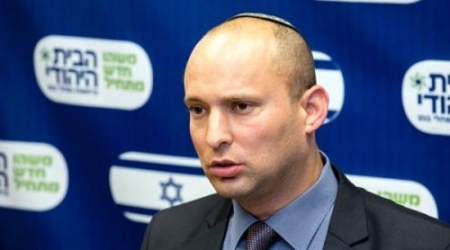 Economy Minister Naftali Bennett on Sunday proposed that Israel annex parts of the West Bank under its full military control where most Jewish settlers live. "I favour implementation of Israeli sovereignty over the zone where 400,000 (settlers) live and only 70,000 Arabs," said the head of the far-right Jewish Home religious party in the ruling coalition. Bennett also ridiculed the US-brokered peace talks between Israel and Palestinian leader Mahmud Abbas, whose writ covers the West Bank but not Gaza, ruled by the Islamist movement Hamas. "This is all a joke. It's as if we're discussing the purchase of a car with only half of its owners," he told public radio. In another negative Israeli assessment of the peace process, Defence Minister Moshe Yaalon said Saturday: "There is no partner on the Palestinian side to reach a two-state solution for two peoples." Their views contrasted with a statement by US Secretary of State John Kerry on Friday at the end of his latest mission to Israel and the Palestinian territories. "I believe we are closer than we have been in years to bringing about the peace and the prosperity and the security that all of the people of this region deserve," Kerry told reporters. Direct negotiations were launched in late July but have made little apparent progress as they approach the half-way mark of a targeted nine months. Hundreds of Palestinian citizens on Thursday rallied outside the compound of Israeli courts in Beersheba city, south of the 1948 occupied lands, to demand the release of their compatriots who had been detained during an earlier protest against the Prawer plan. The protestors, including Negev Bedouins, carried banners condemning Israel's Prawer plan in the Negev region and calling for releasing all detainees who were taken prisoners during the protest that took place last Saturday. Arab Knesset member Taleb Abu Arar said that the sit-in outside the compound turned into a demonstration against the police violence and arbitrary arrests as well as the Israeli plan to displace thousands of the Negev natives from their homes. "The unexpected massive presence of protestors today confirm that out people in the Negev will not accept the injustice inflicted upon them and that the days of military rule and the principle of 'divide and conquer' have ended," Abu Arar stated in press remarks during the rally. "The Israeli authorities have to respond to the demands of our people, revoke the Prawer project and recognize the villages of the Negev Palestinians and their ownership of their land," he added. The residents of the East Jerusalem neighborhood of Silwan were surprised Thursday when they saw collapses and wide cracks in their main road of Wadi Hilweh following rainfall blaming it on excavations underneath their homes and streets. The Wadi Hilweh Information Center said 30-meter-long collapse and cracks were seen in the main access road they take daily in Wadi Hilweh neighborhood. Staff from the Israeli municipality of West Jerusalem made an inspection visit to Silwan spring to which the residents are denied access and where similar collapses most likely occurred, said the center. According to the residents, the municipality along with police arrived at the scene and claimed that the collapses and cracks occurred due to a failure in the sewage system although the sewage system had been restored and the main road asphalted a year and a half ago. 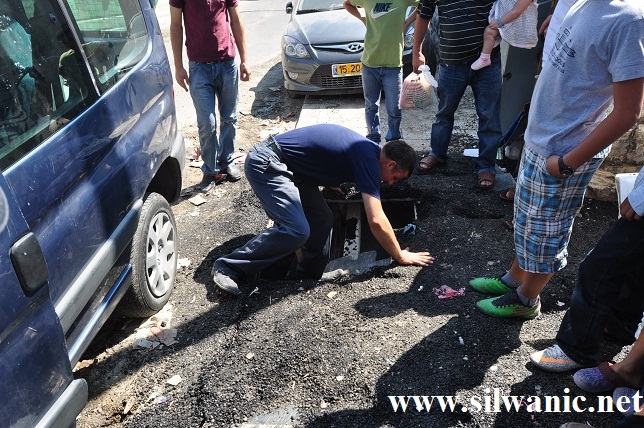 The residents said that such collapses occur every year after rainfall due to the excavations carried out by both Elad settlement organization and Israel Antiquities Authority underneath their houses and streets in Silwan, noting that under the excavations there is a tunnel that connects Silwan spring with Magharbe Gate and plans are made to connect it with the Western Wall. They added that many collapses occurred in Silwan, most notably a collapse of a classroom floor in a UN-run school. Intifada Youth Coalition (IYC) called for stepping up popular resistance against occupation on the 26th anniversary of the first Intifada (uprising) which falls on Sunday, December 8th, 2013. Youth for Intifada Coalition said in a statement that Palestinians are going to mark in the coming days the 1987 Intifada (Stone Uprising) that witnessed the finest pages of Palestinian struggle and resistance in the occupied West Bank, Gaza Strip, Jerusalem and 1948 occupied territories. Popular marches will be organized in all areas of contact in the occupied West Bank, Gaza Strip, Jerusalem and 1948 occupied territories, the statement added. The coalition demanded the Palestinians, especially youth, to confront the Israeli occupier, reminding of the role of youth in igniting and fueling the 1987 Intifada and the 2000 al-Aqsa Intifada. The Palestinian people, who marked the finest pages of struggle and resistance during the two popular uprisings, are able to revolt again against Israeli occupation. Large popular marches and protests have prevailed in different areas of Palestinian territories occupied in 1948 during the last period against Israeli Prawer plan. Palestinian prisoner Moussa Abu Turki's family, from al-Khalil, charged Israeli soldiers of stealing 30 thousand shekels after raiding their house to arrest Moussa at dawn Tuesday. The Israeli soldiers surrounded the house Tuesday morning and arrested Moussa, in addition to stealing 30 thousand shekels from the house, the family added. Meanwhile, Israeli Occupation Forces (IOF) stormed Kafr Kadum town east of Qalqilya and provoked citizens, which led to the outbreak of violent clashes. Local sources said that more than nine military vehicles stormed the town at night and fired a barrage of tear gas bombs. Thirteen citizens were injured. In their turn, Palestinian youths threw stones and empty bottles at Israeli soldiers who set up a military checkpoint at the entrance to the village. On the other hand, Israeli soldiers suppressed on Tuesday a peaceful march organized by Palestinians in Tekoa town east of Bethlehem southern occupied West Bank. The march came in protest at the Israeli settlers' break-ins into the town to perform Talmudic rituals under Israeli army protection, eyewitnesses said. 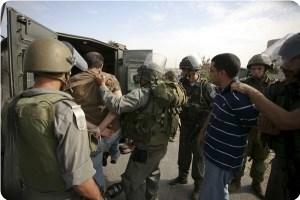 The sources said Israeli soldiers assaulted, in the march, two Palestinian children and detained them for a while. The Israeli settlers had stormed the town and chanted racist slogans against Arabs, while raising Israeli flag. In a related matter, IOF soldiers stormed Qaryout village southern Nablus on Tuesday night, which triggered clashes between Palestinian citizens and Israeli soldiers. Local sources told the PIC reporter that occupation forces raided the village while carrying illustrative maps of the area. 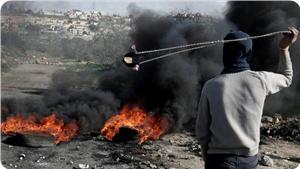 IOF soldiers fired tear gas bombs at the citizens who in their turn threw stones at the Israeli vehicles. On the other hand, Palestinian vehicles were stoned last night by settlers at the entrance of Sinjel town between Nablus and Ramallah. Israeli police ordered media outlets Monday to turn over all photographs taken at Saturday's Naqab (Negev) demonstrations against Israel's Prawer Plan. World Bulletin quoted Israeli daily Haaretz as saying that "police provided no explanation for the unusual order, but they are investigating violent clashes between stone-throwing demonstrators and police, who used stun grenades, tear gas and water cannons during the protests against the Prawer Plan. The "day of rage" demonstrations ended with 34 protesters arrested and 15 officers wounded. The Southern District of the Israel Police force communicated the order directly to photographers via a text message. "All the media in the State of Israel to hand over any documentation of the riots at Hura Junction and the surroundings on November 30, 2013,” the message said. Haaretz and Israel's two biggest news networks, Channel 10 and Channel 2, said they would challenge the order in court. The Israeli occupation classifies approximately 40 villages in the Naqab (Negev) Desert as "unrecognized," arguing that the roughly 53,000 Arab Bedouins living there cannot prove their ownership of the land. The Prawer Plan is said to be a continuation of the 1948 Nakba. The Palestinian Government in Gaza called for cancelling this plan, which grossly violates the constitutional rights of the Arab Bedouin citizens to property, dignity, equality, adequate housing, and freedom to choose their own residence, before it becomes law. 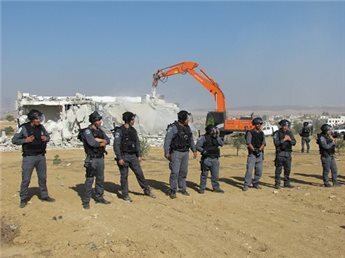 Israeli occupation forces (IOF) demolished at dawn Tuesday a number of houses and agricultural installations in the northern Jordan Valley. Aref Daraghme, the chairman of the municipality of Wadi Malih and Bedouin tribal areas in Tobas province, said that IOF soldiers barged into Adasa and Baki’a areas in the early dawn hours. He said that IOF bulldozers razed two homes belonging to citizens from Tamun village as other bulldozers went on the rampage nearby and destroyed a water reservoir. Daraghme pointed out that the IOF declared both areas closed military zones and prevented inhabitants and journalists from approaching, adding that none of the citizens had received demolition notifications. The municipality chairman charged the IOF with persisting in attacks on Jordan Valley inhabitants in a bid to force them to abandon their native homeland. He recalled that IOF threatened inhabitants of a number of areas in the northern Jordan Valley a few days ago that they should leave their land or else their houses and property would be destroyed. Dozens of Israeli soldiers invaded the Najada area, in Al-‘Oja in the West Bank district of Jericho, and demolished two homes and four sheds. Soldiers also surrounded a number of homes and tents in the area. The Palestinian News & Info Agency (WAFA) has reported that the soldiers invaded the area approximately at six in the morning. It said that several Israeli military jeeps surrounded the area declaring it a closed military zone, before invading it and demolishing the two homes and four structures. The army is threatening to demolish fifteen homes in the area, under the pretext of being built without construction permits. Governor of Hebron and the Palestinian Plains, Majed Al-Fityani, denounced the Israeli assault, and said that Israel is ongoing with its illegitimate polices against Palestinian homes and structures in the Jericho district. He said that the army repeatedly declares the area a “closed military zone”, and continues to harass the residents and destroy their property in an attempt to force them out of their lands. The latest violation is part of ongoing Israeli assaults against the Palestinians in Jericho, as the army has destroyed and demolished hundreds of homes and structures in the area. Israeli occupation forces (IOF) razed 14 installations in Oja village in the Jordan Valley at dawn Monday. Locals and eyewitnesses said that large numbers of IOF and police forces escorted bulldozers and embarked on the demolition spree in Oja, near Tobas city. 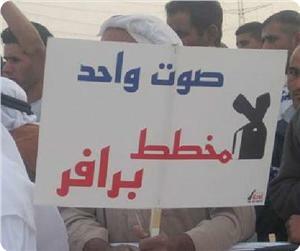 They said that the demolition of houses and agricultural installations led to the displacement of one hundred people. The sources said that the Israeli forces claimed that the installations were built in Area C, which is under Israeli security and administrative control. 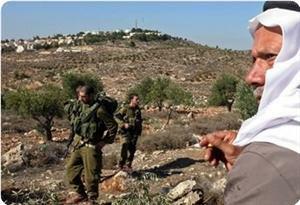 They pointed out that the IOF and police forces withdrew from the village after arresting two citizens. The Hamas Movement called on the Palestinian people, the resistance factions and the political forces to confront and oppose Israel's Judaization and settlement activities in the Galilee region, north of the 1948 occupied lands. In a press release on Sunday, Hamas affirmed that the so-called world Zionist organization's settlement division, one of the Israeli government's executive arms, seeks to bring 100,000 new Jewish settlers to live in the central Galilee in order to create a demographic balance with the region's Arab population. Hamas warned that there would be dire consequences for Israel's persistence in Judaizing the Palestinian land and displacing its natives. Hamas stressed that the Israeli occupation exploits international silence, Arab and Islamic impotence and the Palestinian Authority's acquiescence to the peace process to carry out its Judaization and settlement plans in the occupied Palestinian territories. Hamas also reiterated that it would never give up a single grain of the Palestinian land or accept any compromises in this regard, expressing its belief that Israel's Judaization plans would never succeed in imposing a fait accompli or erasing the identity of the Palestinian land. "Our people in the Gaza Strip, the West Bank, Jerusalem, the 1948 occupied lands, the Negev and the Galilee will rise up in defense of their land, holy sites and constants, and will remain steadfast on their land and faithful to the blood of the martyrs and the sacrifices of the prisoners," Hamas underscored. The Hamas Movement reiterated its strong rejection of Israel's Prawer plan that aims to displace the Palestinian people from the Negev region and urged the Palestinian people and their political forces all over Palestine to stand united in the face of this scheme. In a press release issued on Saturday, Hamas said that the Prawer plan is racist and violates the international law, especially the international declaration of human rights. Hamas also stated that Israel's plans to expand settlements and displace the Palestinian people from their native land are desperate attempts, which will never succeed in changing the history and uprooting the Palestinians from their land. 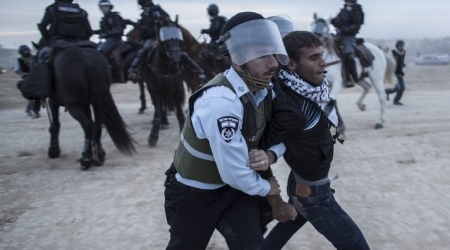 In an incident related to the Prawer plan, violent clashes broke out on Saturday between Palestinian young men from Al-Jalazoun refugee camp to the north of Ramallah and Israeli soldiers following an angry protest against the plan. The Palestinian information center (PIC) reporter in Ramallah said that dozens of angry young men protesting the Prawer plan rallied outside Beit El settlement and tried to open its gate before Israeli armed guards showed up and opened machinegun fire at them. 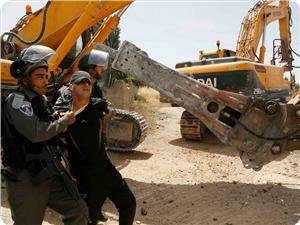 He added that large military reinforcements were sent to the area to protect the settlement and suppress the young men. Afterwards, the Israeli occupation forces (IOF) closed the Ramallah-Nablus road, chased the protestors and kidnapped three of them. One was severely beaten before his detention. A large number of troops also stormed Al-Jalazoun refugee camp and embarked on heavily firing live bullets and tear gas grenades at everyone and everything in the camp. No casualties among the protestors were reported during the intensive gunfire. In another related context, hundreds of Palestinian young men and foreign activists participated in the rally that was organized on Saturday afternoon in Palestine square in Gaza city to protest Israel's Prawer plan in the Palestinian Negev region. The participants carried banners and chanted slogans condemning the Israeli intention to demolish entire villages in the Negev and displace its native population. Israel's Prawer plan is intended to raze 36 Palestinian villages in the Negev region and transfer thousands of natives to other areas despite the fact that these villages have always been there even before the occupation of Palestine. The Israeli occupation authorities (IOA) announced intention to confiscate 1200 dunums of Palestinian land in the town of Deir Estia in Salfit, in the north of the West Bank, to expand settlements established in the area of Wadi Qana. Local sources said that the lands threatened with confiscation belong to citizens from the village of Deir Estia, and added that they will appeal the decision to the Israeli Supreme Court. They pointed out that the confiscation decision was based on a plan to expand the settlement of Yakir, set up on Deir Estia lands. The sources said that the lands contain olive groves and water springs, and added that the settlers have been targeting the region for the past decades. 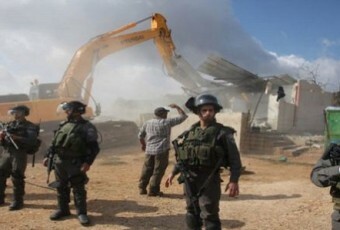 Meanwhile, local sources in the city of Tulkarem in the north of the West Bank said that Israeli occupation forces served demolition notices to Palestinian citizens, claiming their houses were built in Area C, where construction is prohibited. Imad Abu Hamda, head of Zeita village council north-west of the city of Tulkarem, said IOF soldiers raided the village on Saturday morning and handed two citizens military decisions to halt construction work in their houses. Abu Hamda added in a press statement that a month ago the IOA had notified two other citizens that their homes would be razed, claiming they are built in area C.
Israeli occupation forces (IOF) served notifications for the demolition of Khirbet Umm al-Jamal in Wadi al-Maleh, in the Northern Jordan Valley, that would displace about 150 citizens living there. Wadi al-Maleh village council in the Northern Jordan Valley said that the IOF did not specify a date for the demolition, which has intensified the suffering of the inhabitants who are waiting for demolition at any moment. Aref Daraghmeh, head of the village council, appealed in a press statement on Saturday for action against the occupation's decision to demolish the hamlet and to displace the citizens from their lands. He noted that Khirbet Umm al-Jamal was set up on an area of 7,000 dunums, and has been inhabited by Bedouins for decades. Daraghmeh stressed that the plan aims to completely displace the residents of the hamlet through the continued military pressure and the demolition of houses. He added that this plan is part of a bigger scheme to displace the entire population of the Bedouin villages in Wadi al-Maleh in order to expand the Israeli settlements.